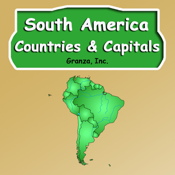 Our Learn South America Countries and Capitals App is an easy-to-use tool for learning the names of 17 different countries of the continent of South America along with their capital cities. The program features a Maps section, a Capitals Section, and a Quiz section. The maps section has easy to read maps of the continent with the country names and the country abbreviations. 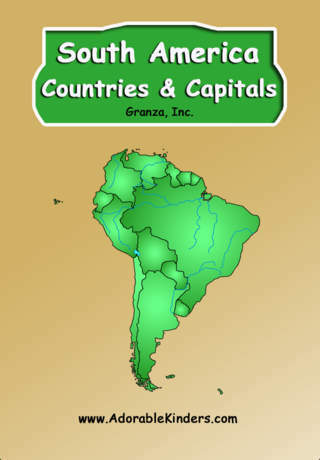 The Capitals section has a colorful detailed map for each of the 17 countries including the capital city name and its location within the territory. With the display of each map, the name of the country and capital city are narrated for the student to hear the proper pronunciation. To obtain more detailed information about any of the countries, the student only needs to tap the image of that country and they will be directed to a related Wikipedia.com online encyclopedia page. The Quiz section has a multiple choice quiz for identifying the capital city of each country. If the student selects the wrong answer during the quiz, a message pops up to tell them what the correct answer should have been, thus helping the student to learn. The score is tallied as the student progresses through the quiz. After answering the last question, the student is taken to the results page to see their final score. A report of the results may be emailed from this page for record keeping. This application is self-contained and does not require an internet connection except for emailing the optional quiz results report or for linking to Wikipedia.com for more detailed information. It is an excellent tool to use by the individual student or for an entire class.